UCLA Housing & Hospitality has taken several steps to increase the efficiency of the water heating systems in the residence halls. These steps have resulted in decreasing natural gas consumption over the last several years. 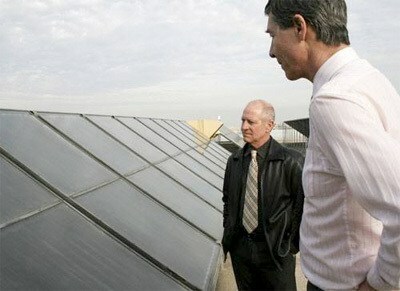 UCLA has solar water heating systems several different residence halls. Rieber Hall, Hedrick Hall and Sproul Hall all have 125 panel systems with 8,000 gallon storage. Dykstra Hall has 125 panel system with only 5,000 gallon storage; however, rather than storing the extra heated water, surplus hot water is diverted to the DeNeve kitchen. De Neve Gardenia and Holly, Sproul Cove and Landing all have newer solar water heating systems that use an evaporated tube technology. These tubes allow more than 90% of the sun’s radiation in, but less than 5% back out. These systems also facilitate easy repairs—when a tube fails, it can be replaced individually rather than having to replace the entire panel. De Neve Holly maintains a 1,500-gallon storage capacity, while De Neve Gardenia has capacity to store 1,800 gallons of hot water. These solar heating systems pump the solar heated water from the panels into the storage tanks; water then feeds into the gas boiler system. The solar heated water enters the gas boiler 20-30 degrees warmer than the incoming city water. As a result, the boilers only need to raise the water temperature another 20 degrees to get to the desired temperature. Since the boilers don’t have to heat the water nearly as much, the buildings with these systems use much less natural gas than they would without the solar assisted heating. Based on the Solar Rating and Certification Corporation (SRCC) ratings for the panels, the combination of these systems save millions of cubic feet of natural gas from being burned each year. Based on EPA emission factor of 120 lbs CO2/Mcf of natural gas, this gas savings prevents almost 300 metric tons of CO2 from being emitted into the environment each year and saves UCLA over $20,000 annually.